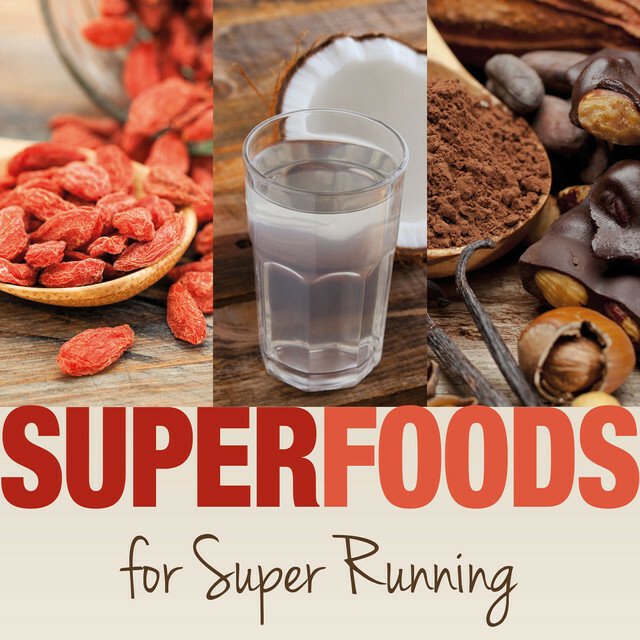 Introducing superfoods into your diet is an easy and effective way of increasing energy, vitality and good health. It can also help to lose excess weight and achieve a body that is in balance, feeling vibrant and alive. Superfoods are foods which contain a much higher level of nutrients and health benefits than most foods. They are often foods which have been used for centuries in exotic parts of the world, where they are treasured for their health-giving properties. We are living in an age where we now have access to these different food groups and the knowledge of how and why to implement them into our diet. Superfoods are both a food and a medicine; they have elements of both. 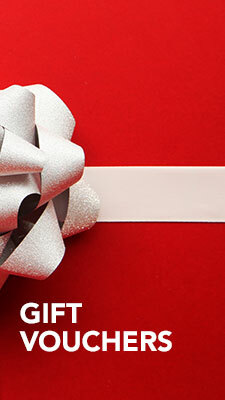 They are a class of the most potent, super-concentrated, and nutrient rich foods on the planet... They have the ability to tremendously increase the vital force and energy of ones body, and are the optimum choice for improving overall health, boosting the immune system, elevating serotonin production, enhancing sexuality, and cleansing and alkalising the body. Superfoods meet and exceed all our protein requirements, vitamin and minerals, glyconutrients, essential fatty acid requirements and so much more... Nourishing us to the deepest level possible, they are the true fuel of today's Superhero." You can find raw cacao in many health food stores and online, sold as raw chocolate bars, whole beans, nibs or powder. Its Latin name is Theobroma Cacao, meaning "Food of the Gods", it is the number one Superfood. Native to the Americas; the Andes, the Amazon, and the basins of South America, it is also grown in Africa, Indonesia and Malaysia, and is imported world wide. Cortez was the first to bring Cacao to Europe in1528, about the cacao drink, he wrote: "The divine drink which builds up resistance and fights fatigue. A cup of this precious drink permits a man to walk for a whole day without food." The Native Americans preferred bitter chocolate, but Europeans preferred a sweeter taste. They added refined cane sugar and milk to Cacao, and cooked it during the mixing process, therefore destroying its medicinal content. Europeans also found it difficult to pronounce the Latin name of Cacao, and so called it Cocoa instead. The traditional raw chocolate superfood has since become a junk food confectionery with no health benefits. The good news is that cravings for this junk food can now be replaced with super nutritious natural raw cacao products and recipes. The cacao bean in its natural state, before it is processed, is extremely beneficial for health. It is packed full of antioxidants. It also contains iron, copper, calcium, magnesium, chromium, manganese, zinc, sulphur, phosphorus, vitamins A, B, C and E, amino acids, and omega 6 fatty acids. It is one of the richest natural sources of magnesium - an essential mineral for runners, as it aids bone strength, prevents muscle cramps and improves heart health. 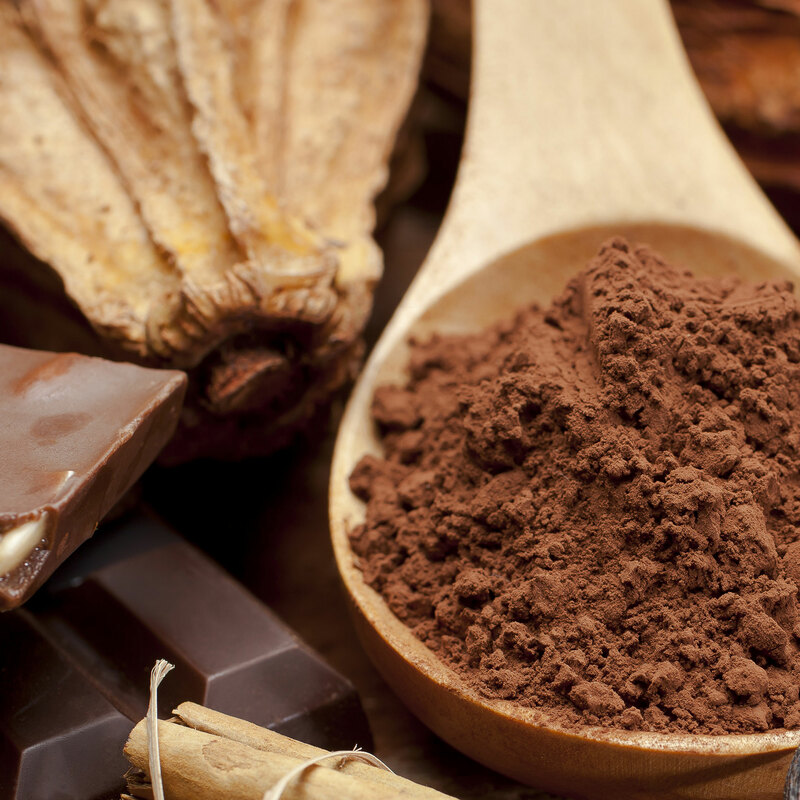 For muscle recovery, try mixing raw cacao with raw carob powder, which is high in calcium. This is a great magnesium-calcium combination, that allows your body to obtain these nutrients from a food source it can easily absorb and utilise. Cacao contains the natural stimulant theobromine, which gives you a boost of natural energy: it stimulates the central nervous system, dilates the blood vessels and relaxes smooth muscles. It also contains phenylethylamine, which controls the ability to focus attention and stay alert, and epicatechin, a flavenoid beneficial for cardiovascular health. It is also said to improve blood flow and learning and memory capacity. When cacao is cooked, it looses its flavenoid content and a lot the health benefits are lost. Cacao also contains anandamide, known as the 'happy hormone' which releases serotonin in the brain making you feel happy, as well as tryptophan, a natural anti depressant amino acid. This is a great way to get you feeling more positive about heading out the door for a long run. Chocolate is good for you - what's not to be happy about?! As a general rule 1 cacao bean per 11-17 pounds of body weight is sufficient, so somebody weighing 140 pounds could consume about 8-13 cacao beans, or a handful of cacao nibs per day. Consuming more than this can be too stimulating and effect regular sleep patterns, especially if it is consumed in the evening. Cacao can also have a laxative effect if consumed in large amounts, as the high levels of magnesium will relax the bowels, and can also be detoxifying as it purges waste from the intestines. Produced from mature coconuts through stone-grinding, heat treating or cold pressing the coarse fibrous coconut meat. By weight, coconut oil has less calories than any other fat source, and is considered to be one of the healthier forms of fat. Although a saturated fat, it is a medium chain triglyceride which is essential for cellular health, and can help to prevent high cholesterol and heart disease - as opposed to the unhealthy long chain saturated fats found in animal fats and dairy products. Coconut butter is also one of the only fats that does not become denatured when heated, so is the safest and healthiest fats/oils to use in cooking. 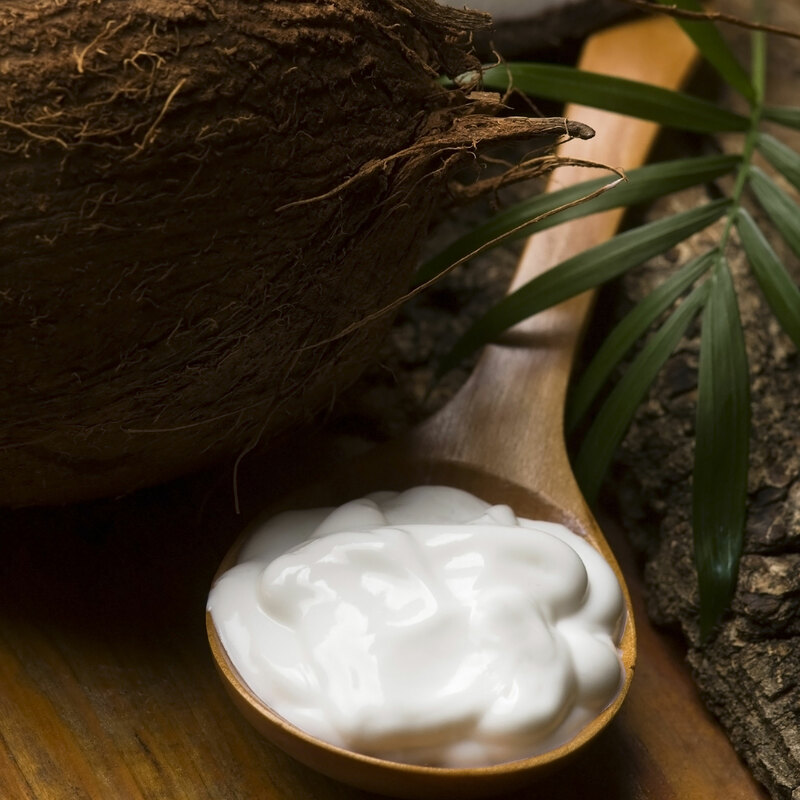 Coconut butter has received bad press in the past for dieters, who have been told to avoid all saturated fats. The long-chain saturated fats almost always go straight to fat storage on the body, however the medium chain fatty acids in coconut butter are burned as an instant energy source, which is perfect before a long run or workout. Coconut butter also helps to stimulate the metabolism, aiding weight loss in the long run, as long as a healthy balanced amount is consumed. Coconut butter contains almost no cholesterol, and actually helps to lower and normalise cholesterol levels. Because coconut butter stimulates the thyroid, cholesterol is then converted by enzymatic processes to anti-ageing steroids; progesterone, DHEA, and pregnenolone, which help prevent heart disease, senility, obesity, cancer and other diseases. Coconut oil also helps to stabilise blood sugar and balance the symptoms of hypoglycaemia, such as low energy, mood swings and stress. Coconut butter is antiviral, antimicrobial, and anti-fungal, naturally fighting viruses, bacteria, and fungal overgrowth such as Candida Albicans, helping to keep the digestive flora in balance. It can also be used as a mouth-wash to kill oral bacteria and prevent tooth decay, gum disease and infection. It is also extremely beneficial used topically to treat skin conditions, such as fungal infections, eczema and psoriasis. It is also a great natural moisturiser. 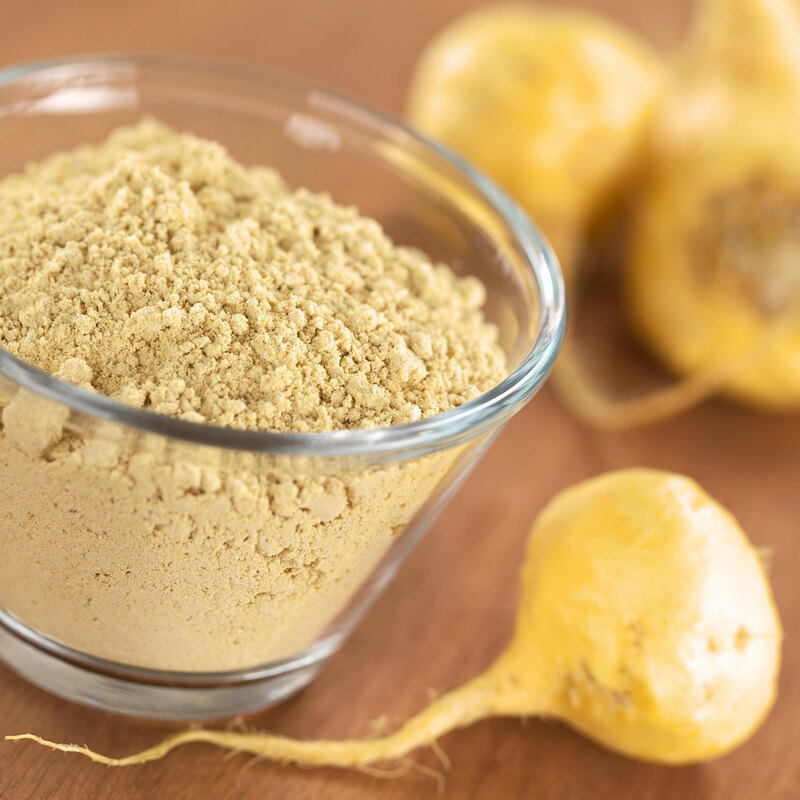 Maca is a root vegetable from the cruciferous family, but is generally sold in powder form, which is great for adding to raw chocolate cakes and smoothies. It typically grows in the Peruvian Andes, over 400m above sea level, and it has been used in the diet of this region for centuries. It is said that Incan Warriors would consume the vegetable prior to battle to increase their vigour and strength. Maca grows in extreme conditions, ranging from 18°C to -10°C. It has one of the highest frost tolerances among its native cultivated species. These conditions give Maca its strengthening properties, and it's a great superfood for those living in cold climates, at high altitudes, or with extreme adventure lifestyles. It is also a popular food supplement for athletes. It is made up of over 50% carbohydrate, providing energy. It also contains protein, calcium, iron and magnesium which are all vital for active people. Maca also contains Vitamin C, B1 and B2. A nutritive substance that counters adverse physical, chemical, or biological sources of stress by raising non specific resistance, allowing the organism to 'adapt' to stressful circumstances." Native to China, goji berries are also known as wolfberries, when grown locally in Europe. They have been used for centuries in Chinese medicine and are widely known as a superfood and longevity fruit. Li Qing Yeun, who was reputed to have lived to 252 years, drank a daily tea of goji berries, ginseng and reishi mushrooms. They are also grown in Tibet, the south west deserts of the U.S and reaching to Mexico and South America. It has been an important food for most native American tribes. The Apaches lived on a diet including goji berries, other wild fruits, nuts, beans and fish. The tribe were known to possess astounding strength, agility, longevity and survival skills. In Chinese medicine, the goji berry is said to increase the Jing energy of the adrenals and kidneys, increasing stamina, strength, longevity and sexual energy. 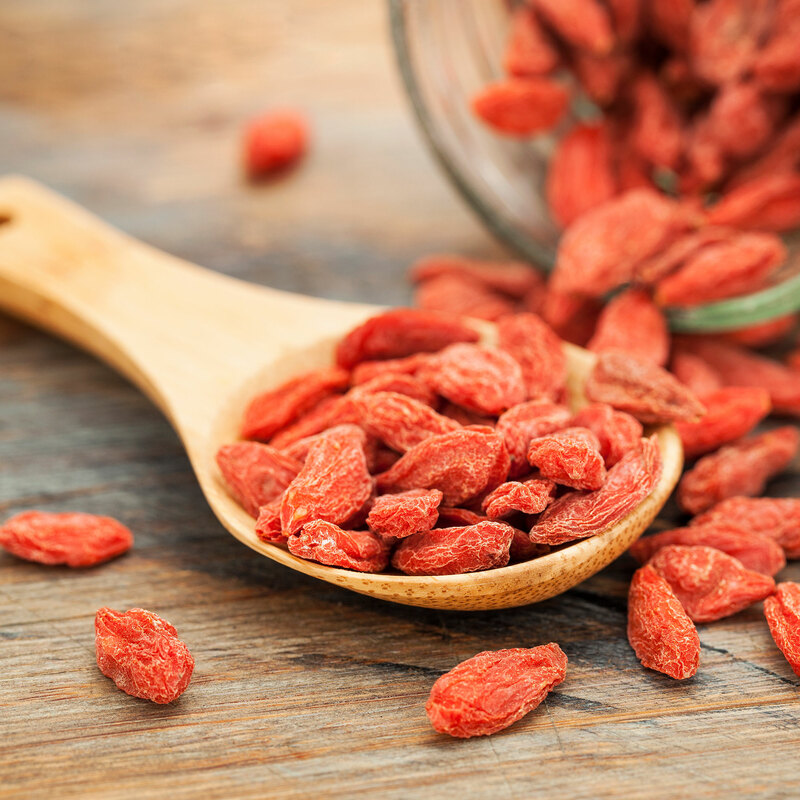 Goji berries are an adaptogen, strengthening the immune system and helping the body to deal better with stress. They produce alkalinity in the body, increase vitality, liver protection, eyesight and blood quality. They contain 6 essential vitamins, 11 essential and 22 trace minerals, 18 amino acids, 5 unsaturated fatty acids, 5 carotenoids, and high levels of antioxidants. Goji berries are a complete protein, aiding muscle repair and strength, as well as calcium, potassium, iron, zinc, selenium, phosphorus, vitamins B1, B2, B6, E and C.
Goji berries are nature's richest source of beta carotene, which enhances thymus gland function, immune system and fights against viral infection. Goji berries also contain betaine which cleanses the liver and has anti inflammatory effects. They balance blood sugar, enhance the liver, digestive system and skin. They are used in Asia for the treatment of diabetes and to help regulate high blood sugar (a precursor to both diabetes and heart disease). Goji berries can be consumed daily (about a handful). They can be used in teas, smoothies, trail mixes with cacao nibs, nuts and seeds. They can be soaked in water for a hydrating beverage. Store in a dry sealed bag or container. Coconut palm trees are prehistoric plants that are distantly related to grasses. Because of this, they are extremely salt tolerant and are actually fertilised by ocean water. They can absorb every mineral known to aid human nutrition. In Sanskrit, the coconut palm is known as 'Kalpa Vriksha' which means "The tree that supplies all that is needed to live". Coconut water, found in the young coconut, is one of the highest naturally occurring sources of electrolytes. Coconut water is a very effective way to rehydrate the body, quickly and efficiently, without taking in a lot of fluids. It is perfect for replacing lost salts and electrolytes that the body looses through sweating during exercising. However, it is not a replacement for regular drinking water, which should also be consumed during and after exercise. Coconut water also contains naturally occurring sugars, which can help with energy levels, and can be fermented using friendly bacteria which feed on the sugars, creating a pro-biotic sparkling energy elixir, called coconut water kefir. This drink is extremely beneficial for health and for replacing the good bacteria in the gut and reducing the overgrowth of Candida. Coconut water is only one chromosome in difference form human blood plasma, and was even used for blood transfusions during World War 2. Plasma makes up 55% of human blood, the remaining 45% is haemoglobin, which is essentially transformed plant 'blood' or chlorophyll. Therefore if we consume a drink of 55% fresh coconut water and 45% fresh green juice, we have an instant blood transfusion in a drink! 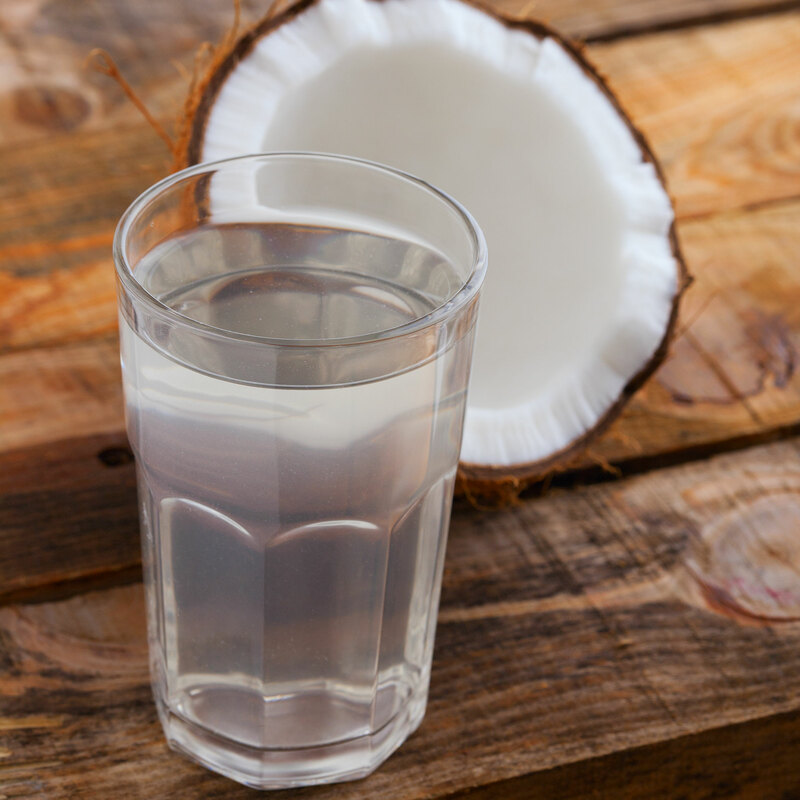 Coconut water is very high in potassium and should be avoided by those with hyperkalaemia (excessive potassium), renal failure, acute adrenal insufficiency, low urine output due to haemolysis, or those treated with a snakebite serum. Chia seeds are native to Mexico and Guatemala, and have been used for centuries for their nutrition and health giving properties. As featured in the popular book Born to Run, chia seeds taken with water and lime is a traditional energy/electrolyte drink used by Mexico's Tarahumara Indians, the world's greatest distance runners, who can go for hundreds of miles without rest. Chia naturally helps the body to rehydrate, and can be taken as a drink by adding 1-2 teaspoons to your water bottle with a dash of lemon or lime juice and sweetener to taste. It is always best to soak Chia seeds prior to eating them. A gel like consistency is created which is extremely beneficial for the digestive system, and helps the body to absorb the natural oils and nutrients within the seed. 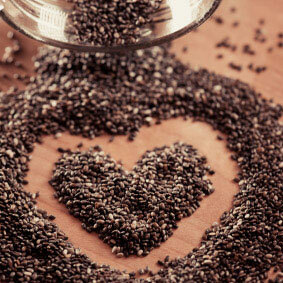 Chia seeds are full of omega 3 and 6 fatty acids, which are great for lubricating joints and cells. Chia is said to reduce risk of heart disease, lower cholesterol, and reduce blood pressure, as well as balancing hormones. Chia contains protein and calcium, aiding muscle growth and repair, and bone strength. It also contains iron, zinc, fibre and antioxidants. Spirulina is a blue-green freshwater algae, often dried into powder or tablet form, revered by the Aztec dynasties as a superfood - they even mixed it with chocolate. Through photosynthesis, sunlight converts the algae into pure protein, carbohydrates, fatty acids and other nutrients. Spirulina contains about 65-71% protein. It contains all the essential amino acids, making it a complete protein, which is a great aid in the vegetarian and vegan diet. Spirulina was the primary protein source in Mexico city for thousands of years. 50% of the protein in foods is lost through cooking. Because spirulina is a raw pure protein source it is one of the richest sources available which can be easily absorbed in the body in liquid form, by adding the powder to water. It is also a much more sustainable source of protein than animal protein. Spirulina, a full-spectrum protein, is known to balance the brain chemistry and help us cope with stress and balance moods. A normal dose would be 6-10g per day, a super-athlete dose would be 30+g per day. Ancient algae and plankton such as spirulina, are amongst the simplest and most ancient of all life forms. They provide the fundamental nutrient and food sources for all life on earth, they are the basis and beginning of the food chain. It is rich in vitamins A, B1, B2, B6, E and K, plus chlorophyll, iron, salts, phytonutrients and enzymes. It is the best source of Gamma Linolenic Acid (GLA), an anti inflammatory essential fatty acid which supports the nervous system and helps fight the inflammatory symptoms of arthritis. It is good for the blood, boosts the immune system and is high in antioxidants. 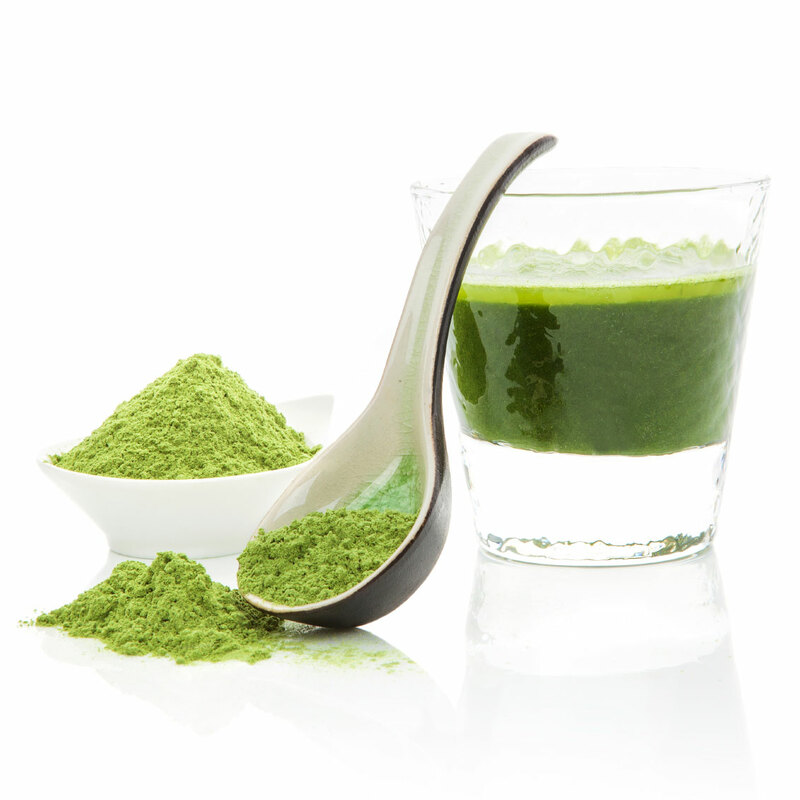 Check out my article on Natural Energy Drinks for yummy ways to use spirulina.